We’d love your help. Let us know what’s wrong with this preview of Grand Theft Horse by G. Neri. Gail Ruffu was a rookie trainer known for her unconventional methods and ability to handle dangerous horses. When she became part owner of an untamed thoroughbred named Urgent Envoy, everything changed. After Urgent Envoy showed real promise, her co-owners forced Gail to speed up training and race him too early, causing the horse to develop a hairline fracture. Refusing to Gail Ruffu was a rookie trainer known for her unconventional methods and ability to handle dangerous horses. When she became part owner of an untamed thoroughbred named Urgent Envoy, everything changed. After Urgent Envoy showed real promise, her co-owners forced Gail to speed up training and race him too early, causing the horse to develop a hairline fracture. Refusing to drug the horse to keep it running, Gail lost Urgent Envoy to her partners, who pushed the horse even harder. One more race would kill him. When nobody heeded her warnings, Gail had to act. To ask other readers questions about Grand Theft Horse, please sign up. After finishing this biographical GN about a courageous and tenacious woman trying to save a race horse, I just want to know: How can I help? Absorbing graphic novel about an ethical horse trainer who tangles with unscrupulous forces within her industry, leading her to essentially kidnap her own horse. If you like stories about the underdog fighting for what's right, give this a try. It would be amazing adapted as an indie film. Somehow, based on the cover's similarity to the disappointing , I had subconsciously decided I was not going to like this book after I had picked it up from the library. I forced myself to start reading it this week because I had run out of renewals and the due date is looming. As I rarely look at the back cover copy for graphic novels, I had no idea what the hell I'd be reading when I turned to the introduction. Turns out this is based on a true story about Gail Ruffu What a pleasant surprise! Turns out this is based on a true story about Gail Ruffu, a 57-year-old woman, who was tried in 2006 for horse theft. Ruffu comes off as a straight-up Quixotic figure, a colorful character who is wholly sympathetic in her desire to keep the horse safe from abuse but also has an unreliable quality as a narrator, exhibiting paranoia and allowing herself to devolve into a life of deprivation as she goes to extremes to keep to her ideals. She alternates between off-putting and admirable, but you cannot turn away from her. The complicated events and legal matters are skillfully laid out by author (and Ruffo's cousin) G. Neri culminating in a criminal trial and then a civil case that escalated to the California Supreme Court. Corban Wilkin's cartoony art style keeps the tone light and gives the story energy even in talking heads sequences. In the end, its a pretty damning expose of the horse racing industry. I liked that this was inspired by a true story and that the protagonist was a true good guy, but the world of horse racing portrayed was really depressing. Did not care for the art. A catchy title like this will garner this graphic novel some attention...but only if it delivers on its promise of an exciting story -- which it does, splendidly! Divided into seven parts with each labeled as if a horse race is being run, Coretta Scott King Honor winner G. Neri tells the story of his cousin's turbulent life protecting Urgent Envoy, a race horse whose destiny was to be a long-term racing champion. The story opens with Gail meeting Urgent Envoy and finding a partner to pay for the A catchy title like this will garner this graphic novel some attention...but only if it delivers on its promise of an exciting story -- which it does, splendidly! Divided into seven parts with each labeled as if a horse race is being run, Coretta Scott King Honor winner G. Neri tells the story of his cousin's turbulent life protecting Urgent Envoy, a race horse whose destiny was to be a long-term racing champion. The story opens with Gail meeting Urgent Envoy and finding a partner to pay for the horse, with her doing her part to train him. Neri jumps back to 1950's Texas and shows Gail's childhood, of how she learned to care for horses, then training her first one. Jumping to 2005, Gail's partners pressure her to race Urgent Envoy against her better judgement. Neri uses flashbacks through the rest of Gail's tale to give readers insight into Gail's reactions to the pressures put on her by her former partners as they dismantle her life and push her through the court system on a charge of horse theft. Gail's story is very compelling to read. Readers will empathize with her, cheering her on to "fight the good fight". The court scenes will have a familiar rhythm to regular viewers of TV crime shows. The frustration felt by Gail in her situation is palpable. Black & white artwork by Corban Wilkin is rough, but works well with the spirit of this book. The book closes with a couple of pages of sepia color photographs of Ruffu and her family and an afterward written by Ruffu. Hand this one to animal lovers and to fans of crime and court scenes. Oh man. I am continually reminded that comics and graphic novels can be more, and already *are* more, than I can possibly imagine. This nonfiction biographical piece ranks up there with Brian K. Vaughan and Niko Henrichon's Pride of Baghdad and Max Brooks and Caanan White's The Harlem Hellfighters as an exemplar of the form. Corbin Wilkin's art is monochrome but delightful, the real-world character of Gail well-drawn and well-rounded, and the plot moves. Auxiliary material highlights the rea Oh man. I am continually reminded that comics and graphic novels can be more, and already *are* more, than I can possibly imagine. This nonfiction biographical piece ranks up there with Brian K. Vaughan and Niko Henrichon's Pride of Baghdad and Max Brooks and Caanan White's The Harlem Hellfighters as an exemplar of the form. Corbin Wilkin's art is monochrome but delightful, the real-world character of Gail well-drawn and well-rounded, and the plot moves. Auxiliary material highlights the real story behind the graphic novel, but as with the main text itself, you get just enough of everything and not a whit more. This book is a study in restraint, really. How do we book-talk this and get it in the hands of middle school students (7-9th grade)? I'll never look at horse racing the same way again. I'd visit other reviewers' synopsis of the storyline and gravity of the content in this book. Here's a few thoughts for what you might include in a book-talk or introduction to this book. What are you willing to go to jail for? What are you willing to do to save a person or an animal How do we book-talk this and get it in the hands of middle school students (7-9th grade)? I'll never look at horse racing the same way again. I'd visit other reviewers' synopsis of the storyline and gravity of the content in this book. What are you willing to do to save a person or an animal or stand for a cause? What are you willing to spend hours learning to do in order to save someone or some animal or to work for a cause? Would you be willing to stand up to the abuse of animals? Would you be willing to go to jail and have a criminal record to stand up for an animal or a cause? Would you be willing to spend hundreds of hours learning the law so that you could represent an animal in court? Would you be willing to give up your home? Running water? A live-able wage? You might read the author's note at the beginning of the book - it draws you in and makes you want to know more or read the book. You might also project a few of the first pages - using a document camera or, if you have access to the internet, share the two-page spreads that are available for view at the publisher Lee and Low's site. Give students a chance to look carefully and notice and begin to predict and to talk in small groups. *Why is the Bob Dylan quote at the beginning of the book a relevant quote for this story? ("To live outside the law, you must be honest." *How can we use Gail Ruffu's experience as a lens for defining words like perseverance or determination? *What is the power of telling this story via illustration vs. telling this story via running text? It's rare that a book catches me completely off guard. Grand Theft Horse is one such book. The short introduction makes it clear that this real-life story caught Greg Neri by surprise as well. When a distant relative mentions to him that she's wanted in California for horse thievery, he thinks, "that sounds like a great story." And boy is he right. Grand Theft Horse follows horse trainer Gail Ruffu as she finds the perfect racing horse, gets swindled by her partners, steals the horse, and fights t It's rare that a book catches me completely off guard. 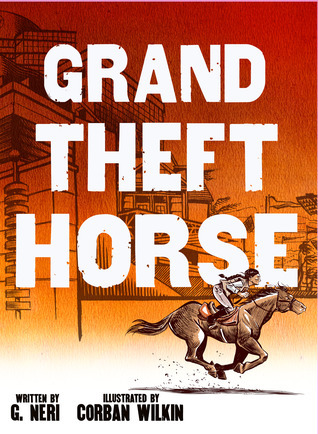 Grand Theft Horse is one such book. Grand Theft Horse follows horse trainer Gail Ruffu as she finds the perfect racing horse, gets swindled by her partners, steals the horse, and fights the powers aligned against her to keep the horse from being killed on the track. There's much more than that though - there's a brutal examination of horse racing's dark secrets, a thoughtful portrayal of a girl who always loved horses more than people, and a riveting courtroom thriller that shows how the system is set up to screw the little gal. In short: I was transfixed. I often read graphic novels in one sitting, but I started Grand Theft Horse at 11 PM, in bed, fully expecting to set it down and go to sleep. An hour and a half later, I finished the book, breathless and wide awake. Neri perfectly paces Gail's story, ratcheting up the tension as forces seem to align against Gail, then cutting away to a quiet moment in the past so we can catch our breath. The brownscale art by Corban Wilkin is perfect too - it's simple, clear, and beautiful. Characters are wonderfully easy to tell apart with broad, expressive faces. And anyone who can draw this many horses with this much precision is a master of the craft. This was such an interesting graphic novel. About a month ago I went to see author Andrew Smith speak and an audience member asked him for some of his current book recommendations - Grand Theft Horse was one of these. :) And I'll be 100% honest, I straight up trusted Andrew's recommendation and didn't bother to read anything about the book so goodness was I surprised when I found out it was a non-fiction graphic novel with art in a monochromatic brown. I knew absolutely nothing about this woman This was such an interesting graphic novel. About a month ago I went to see author Andrew Smith speak and an audience member asked him for some of his current book recommendations - Grand Theft Horse was one of these. :) And I'll be 100% honest, I straight up trusted Andrew's recommendation and didn't bother to read anything about the book so goodness was I surprised when I found out it was a non-fiction graphic novel with art in a monochromatic brown. “And the next thing you know your son is playing for money in a pinched-back suit. And list’nin to some big out of town jasper, hearin’ him tell about horse-race gambin’. Not a wholesome trottin’ race, no! But a race where they set down right on the horse! Like to see some stuck-up jockey boy settin’ on Dan Patch? Make your blood boil? I periodically receive review copies of instruction manual-style books for children and teens that seek to motivate young, budding activists. For the most part, they leave me pretty cold. How often do you get jazzed from reading an instruction manual? But give me a true story that reveals a heartbreaking problem or unjust situation, and I’m often moved to do something. That’s why, having read GRAND THEFT HORSE, I’ve just finished writing to my state senator. Next in the works is a letter to my governor. “I’ve been around horses my whole life. Horses were everything to me. Nothing else mattered. GRAND THEFT HORSE is the story, both captivating and horrific, of Gail Ruffu, as told in graphic novel format by her cousin G. Neri and illustrator Corban Wilkin. Gail, who has loved horses since she was a little girl, grew up to become a licensed horse trainer, and developed an ability to work with dangerous horses. She then found a spirited yet amazing horse to buy and train, Urgent Envoy. Unfortunately, she ended up with business partners who were only interested in reaping immediate returns on their investment and not at all interested in the welfare of the animal. When Urgent Envoy became injured, the business partners insisted on disregarding veterinarian instructions and, instead, having the horse doped up so that he would run until he dropped. Seeing no alternative, Gail snuck the horse out of the training facility and, hid him away in a distant neighborhood boarding stable. This led to her trainer’s license being taken away and the threat of jail unless she returned the horse to be dealt with as the business partners wished. GRAND THEFT HORSE is the triumphant graphic biography of a horse lover turned activist. Told from Gail’s point of view, it begins with the “theft” of the horse and moves between her young years of yearning for a horse, time in Europe when she learned formal equestrian skills, and her life as a professional. After hiding the horse from her partners and losing her trainer’s license, Gail spent years living hand-to-mouth, scraping up the money to keep her beloved horse housed and fed, while training herself to digest legal journals in order to fight for the life of her beloved steed. Eventually, Gail found a lawyer who believed in her quest and, together they won Gail’s case in California Supreme Court. It’s a breathtaking, top-shelf read for the horse-crazy kids in your family or in your library. But the book also serves as a stunning exposé regarding today’s horse racing business. The money wagered on horse races makes it a business that is closely regulated by the states. And that means that associated issues of animal cruelty revealed here should be state issues, too. I love reading about and being inspired by women who take up a fight for what’s right. Gail Ruffu’s story had me recalling the grit of Diane Wilson in Molly Bang’s NOBODY PARTICULAR: ONE WOMAN’S FIGHT TO SAVE THE BAYS (2000). I grew up with a pair of crazy horse lovers in my life: my sister and her best friend. They both still own and ride horses. Don’t tell them, but I’ve just ordered them gift copies of this book. An interesting non fiction book written in comics form about a trainer who decides to save a horse from racing when its apparent its not fully healed from injuries. She lost everything saving that horse and would do it all over again. I don't think I'll be watching the big races anymore. It's a dirty world. Riveting account of an underdog (brash, brave woman who gives all) against the establishment (dirtbag lawyer, shady gross animal abusers with big money) who stops at nothing to save and keep her animal. Highly recommended. I have made a goal to read at least two graphic novels a month, and this was my first one for January. It was delightful! I got so engrossed in the story I stayed up late reading. Had to find out what happened. I spent some time thinking about if I would have liked the story better as a traditional book--but I think not. The illustrations definitely made a difference. Very fun, I'm looking forward to more. Great non fiction graphic novel. Story of one woman who grew up loving horses, became a horse trainer in CA racing circuit. Saw potential in one $5K horse but when shared ownership goes wrong and the other owners want to force an injured horse to run...when running might cause death....what would you do? True story of one woman willing to stand up for what she believes in. Good story, good pic Great non fiction graphic novel. Good story, good pictures-especially the horse movements. Only a couple curses: damns and dammits. Interesting look at morals, abuse of privilege, court system, horse racing, and increases awareness of ethics in horse racing- or lack there of. A riveting tale of a woman, her horse, and her principles. Gail Ruffu loved horses ever since she was a child. Lots of kids go through a horse phrase, but Ruffu's affections only grew over time as she learned to care for, train, and race them. When at last she gains part ownership of a magnificent fella named Urgent Envoy, Ruffu thinks she's in horse heaven. However, her troubles are just beginning, no thanks to her sneaky, duplicitous co-owners, who have very different ideas about how racehorses A riveting tale of a woman, her horse, and her principles. Gail Ruffu loved horses ever since she was a child. Lots of kids go through a horse phrase, but Ruffu's affections only grew over time as she learned to care for, train, and race them. When at last she gains part ownership of a magnificent fella named Urgent Envoy, Ruffu thinks she's in horse heaven. However, her troubles are just beginning, no thanks to her sneaky, duplicitous co-owners, who have very different ideas about how racehorses should be treated, trained, and fielded. Truth is always stranger and more delightful than fiction, and Ruffu's tale of stealing the horse she loves to save him from harm is a tangled, twisted yarn that will keep readers riveted and breathless. Her co-owners do everything in their power to get Urgent Envoy back, including strip Ruffu of her license and charge her with the titular "grand theft horse," an actual California law still on the books. Will Urgent Envoy be safe? Will he ever get to race again? How many times can Ruffu bounce back up after getting knocked down? The book divides easily into three parts: Ruffu's early life and horse training background, the training and rescue of Urgent Envoy, and the lengthy legal battles involved in getting justice for both horse and trainer. The legal sections are as fascinating and well-paced as the rest of the book (call it a steady gallop), especially after Ruffu runs out of money and legal assistance, and is forced to become her own lawyer. If you've got teens and tweens in your life who love horses -- or any animal, really -- they will eat this up with a spoon. Gail Ruffu wanted to try to train a racehorse using unconventional methods better for the health of the horse. At first her partners agreed with her methods, but when they got impatient for the horse to start earning money they ignored their agreement to follow her methods and went the more conventional route. When Gail found out that they were going to race Urgent Envoy on a fractured leg, she took the horse for its own safety. And what followed was a long and painful fight for justice for both Gail Ruffu wanted to try to train a racehorse using unconventional methods better for the health of the horse. At first her partners agreed with her methods, but when they got impatient for the horse to start earning money they ignored their agreement to follow her methods and went the more conventional route. When Gail found out that they were going to race Urgent Envoy on a fractured leg, she took the horse for its own safety. And what followed was a long and painful fight for justice for both Gail and the horse in a struggle of the havenots and the voiceless going up against the wealthy and powerful. This is one of those nonfiction/biographical graphic novels that make you angry. But it should make you angry. This is not a fun story. But it is an important story. Gail Ruffu went through years of suffering because she chose to do what she felt was right instead of what was easy. Her story brings to light some serious issues in the horse racing world's ethics and practices as well as the struggle for the poor to get justice when up against rich and powerful people. So this isn't necessarily something you pick up to entertain yourself or hand to others to entertain them. It is meant to inform, equip, and motivate...and just maybe help change the tide in the future. Sometimes those books can be too weighty and teens can't make it through them. Or they are dry as dirt and the pull to turn the page isn't there. But the graphic novel format of this book and Ruffu's story has the right balance. There's heft to the story but enough engagement and energy to keep the pages turning. There's seriousness and tastes of real hardship, but a dose of hope too. If you're looking for a powerful read about animal's rights or social justice for teens on up, this may be just the thing. This is the true story of a woman who bought a race horse with another person - but that person was a lawyer and he brought in a number of other people without telling her and changed the terms of their agreement, resulting in disaster for both her and the horse. In order to save the horse from the cruel treatment and from bodily harm, she "stole" him (he was 20% hers after all) and took him to a safe place. The other owners then took her to court and took away her training license and her livel This is the true story of a woman who bought a race horse with another person - but that person was a lawyer and he brought in a number of other people without telling her and changed the terms of their agreement, resulting in disaster for both her and the horse. In order to save the horse from the cruel treatment and from bodily harm, she "stole" him (he was 20% hers after all) and took him to a safe place. The other owners then took her to court and took away her training license and her livelihood, costing them much more than the price of the horse itself. A fascinating story with a horrifying look at the cruelty inherent in the world of horse racing. Personally, I wasn't fond of the sepia tones used for the illustrations, but it worked. A good story but won't jump of the shelves; will need to be hand sold most likely. People do need to read this - and something needs to be done about this issue! I had to work hard to find a copy of this book, but it was worth all the effort! If you, or someone you know is into horses, get this book. It's based on the true story of the author's cousin, Gail Ruffu, who lost everything to save the life of a horse she was part owner of. Gail Ruffu is an inspirational role model. What you learn about horse racing in America is appalling. "In American horse racing, twenty-four racehorses (on average) die every week on racetracks." This doesn't include the tho I had to work hard to find a copy of this book, but it was worth all the effort! If you, or someone you know is into horses, get this book. It's based on the true story of the author's cousin, Gail Ruffu, who lost everything to save the life of a horse she was part owner of. Gail Ruffu is an inspirational role model. What you learn about horse racing in America is appalling. "In American horse racing, twenty-four racehorses (on average) die every week on racetracks." This doesn't include the thousands who are sent to slaughterhouses to be killed because of injuries caused by reckless trainers and breeders. Perfect as a graphic novel this biographical story of "grand theft horse" rather than "grand theft auto" features a cousin of Neri's who cared for the well-being of the love her life, a horse Urgent Envoy, at the disadvantage of the justice system and other owners who wanted to prosecute her for stealing the horse away from mistreatment. It's a different side of horse culture, one of racing, but for Gail, one of love and passion. A female in a man's world. The bond between human and animal. I en Perfect as a graphic novel this biographical story of "grand theft horse" rather than "grand theft auto" features a cousin of Neri's who cared for the well-being of the love her life, a horse Urgent Envoy, at the disadvantage of the justice system and other owners who wanted to prosecute her for stealing the horse away from mistreatment. It's a different side of horse culture, one of racing, but for Gail, one of love and passion. A female in a man's world. The bond between human and animal. I enjoyed the action of the story itself, including the pacing and interestingly, the court case and prosecution. It's was just as much an element as the events leading up and after. YA author G. Neri writes, "I'm like a mash-up DJ of a writer: I sample real life and re-mix it into story." True to form, he delivered a thoughtful remix of horse trainer Gail Ruffu's life in "Grand Theft Horse." Neri retells Ruffu's feat to steal-- or, rather, rescue--her extraordinary racehorse Urgent Envoy, only to be labeled an outlaw and face Grand Theft Horse charges in the California Supreme Court. This graphic biography is a horselover's tale and whimsical girls-rock adventure. #JozefBoo YA author G. Neri writes, "I'm like a mash-up DJ of a writer: I sample real life and re-mix it into story." True to form, he delivered a thoughtful remix of horse trainer Gail Ruffu's life in "Grand Theft Horse." Neri retells Ruffu's feat to steal-- or, rather, rescue--her extraordinary racehorse Urgent Envoy, only to be labeled an outlaw and face Grand Theft Horse charges in the California Supreme Court. This graphic biography is a horselover's tale and whimsical girls-rock adventure. A real pleasure! An amazing story of perseverance unlike anything I have read before. This was a real page turner. I also learned a lot about the physical stress racing puts on horses so it was a nice learning experience for me. The illustrations were great (particularly the character's expressions),. The main character was fascinating study of perseverance. This held my interest to the end. I also enjoyed the photos and the afterward got my attention. I consider the time that I spent on this ti A real pleasure! An amazing story of perseverance unlike anything I have read before. This was a real page turner. I also learned a lot about the physical stress racing puts on horses so it was a nice learning experience for me. The illustrations were great (particularly the character's expressions),. The main character was fascinating study of perseverance. This held my interest to the end. I also enjoyed the photos and the afterward got my attention. I consider the time that I spent on this time well spent. G. Neri is the Coretta Scott King honor-winning author of Yummy: the Last Days of a Southside Shorty and the recipient of the Lee Bennett Hopkins Promising Poet Award for his free-verse novella, Chess Rumble. His books have been translated into multiple languages in over 25 countries. They include the novels Tru & Nelle, A Christmas Tale, Ghetto Cowboy, Knockout Games, Surf Mules, and two free G. Neri is the Coretta Scott King honor-winning author of Yummy: the Last Days of a Southside Shorty and the recipient of the Lee Bennett Hopkins Promising Poet Award for his free-verse novella, Chess Rumble. His books have been translated into multiple languages in over 25 countries. They include the novels Tru & Nelle, A Christmas Tale, Ghetto Cowboy, Knockout Games, Surf Mules, and two free-verse picture book bios, When Paul Met Artie and Hello, I'm Johnny Cash. In 2017, he was awarded a National Science Foundation grant that sent him to Antarctica.